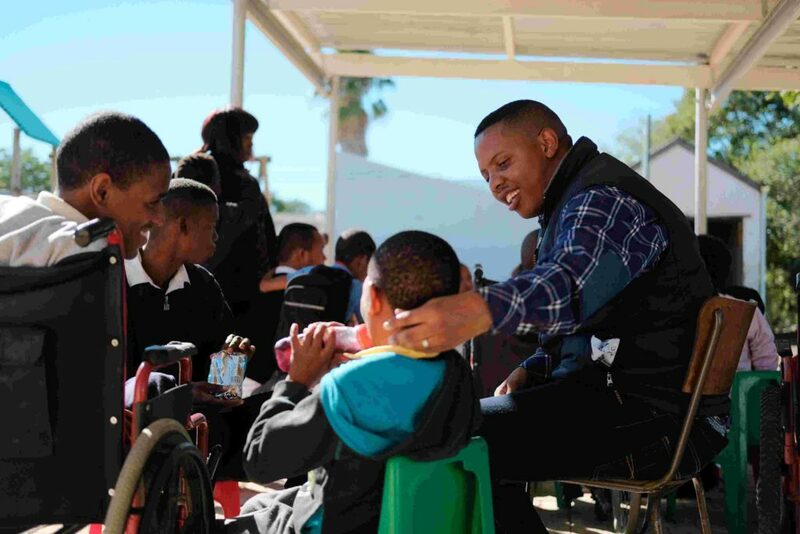 Siyanakekela Disability Special Day Care Centre, which provides special care to differently abled children, is the only such community centre for children with severe mental and physical disabilities in Adelaide, Eastern Cape. This is one of the reasons that Cookhouse Wind Farm has been supporting this very special Day Care Centre since 2015, funding the purchase of a much needed school building in addition to computers, outdoor and physical therapy equipment. Cookhouse Wind Farm’s support for Siyanakekela Disability Special Day Care Centre, which has been ongoing for almost three years, also provides training and support in the development of the Day Care Centre’s management capabilities. This is to help ensure that this organization will be able to generate a substantial portion of their operational costs through fundraising, increased parental involvement and a stable donor base. “Our Local Economic Development Programmes aim to empower our beneficiary communities so that they can achieve greater independence, which is especially important for Siyanakekela Disability Special Day Care Centre as the facility currently does not receive funding from the Department of Social Development,” explained Suzile Mabaso, Chief Community Operations Officer for Cookhouse Wind Farm. Prior to Siyanakekela Disability Special Day Care Centre opening its doors in 2010, there was no school or care facility for children with disabilities in the Adelaide vicinity. This unfortunately often resulted in neglect, as many families weren’t capable or equipped to care for a differently abled child. The Centre provides a safe haven and offers two meals a day for these children. They are also taught elementary literacy skills, attend basic educational programmes, physiotherapy sessions, and much loved handcrafting. In short, the centre is fully equipped to meet the needs of the 40 children it cares for in addition to providing the necessary skills and training for its caregivers. “Siyanakekela Special Daycare Centre provides an important service to the community of Adelaide. The care for differently abled persons is a prudent service as most community members are ill-equipped to provide the necessary care and support to family members whom are differently abled and for this reason we are pleased to partner with them as part of Cookhouse Wind Farm’s socio economic development programme,” concluded Mabaso. Situated approximately 120km north east of Cookhouse in the Blue Crane Route Municipality in the Eastern Cape, Cookhouse Wind Farm produces enough green electricity to supply approximately 43 000 medium-income South African homes with electricity. The wind farm spans 2 600 hectares of agricultural land and has an installed capacity of 138.6 MW, comprising of 66 (2.1MW) wind turbine generators.